I hadn’t worked on an illustration for the Radio Times for a few years so I was extremely pleased to be contacted for a new radio section piece to appear in the first issue listings of the new year. 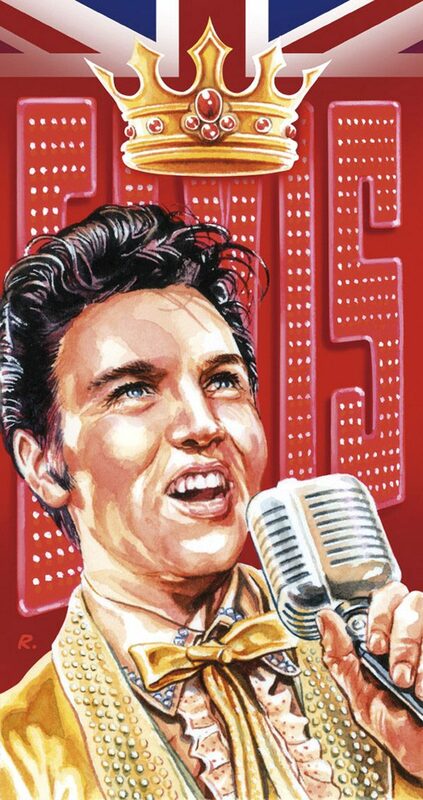 The brief was to create something to promote an Elvis Dream Concert. An imaginary UK concert (the King having sadly never performed in Great Britain) from a vast selection of live recordings. So I needed to create an illustration that successfully conveyed Elvis throughout his career, live on stage and the UK connection. I could have easily picked the era of Elvis of loud jump suits and capes but I wanted to pick that moment between American kid next door with the hips that rocked and the first loud golden suit that marked a showman on stage. This is the first Radio Times piece I’ve painted, the others being created in ink and then computer coloured. I painted nearly every element in watercolour, but knew I’d be happier adding the the Union Jack graphic at the top in Photoshop and adjusting the Elvis name in lights and general vibrance of the piece by computer. I think it works well and I hope I get a return visit to the magazine soon.